Dá pra ver porque eu sempre admirei Yahara Sensei. Quando ele esteve lá na SEAERJ fiquei bastante impressionado. Lembro do Sensei Takeuchi falando que gostava do jeito dele. Dizia: "Esse cara parece com eu! Ele é Raça Animal!" 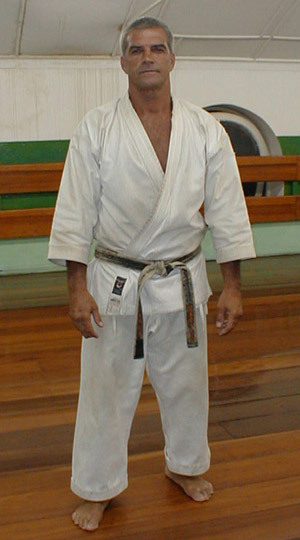 Como dizem, um grande guerreiro reconhece outro.... Lembro que o Sensei e Yahara Sensei tinham ambos 33 anos naquela época e o Sensei ficou também impressionado com o nível técnico e espírito de Yahara Sensei, assim como sua humildade ao responder "não sei" sem nenhuma vergonha às perguntas que transcendiam seu conhecimento. — Actually, it is not as difficult to answer your question as you would expect. I think that there are two reasons. The first reason is psychological: the world of Mr. Yohji Yahamoto is the magnificent world with the brilliant atmosphere and amazing surroundings. Of course, this atmosphere dims the enthusiasm. Photographers, cameras, beautiful people and clothes have a very strong influence on his emotional condition because he is part of this world. Karate allows him to restrain himself and allows him to follow the spiritual way which is defined by conscience. Karate is the deterrent that gives him a chance to remain himself. The second reason is physical: the work of Mr. Yamamoto implies the sedentary way of life and it does not have a good effect on his health. Weak muscles are not good for man and due to his practice of karate, he now has good physical condition. I think that Mr. Yamamoto has the budo consciousness that only a true samurai could have. 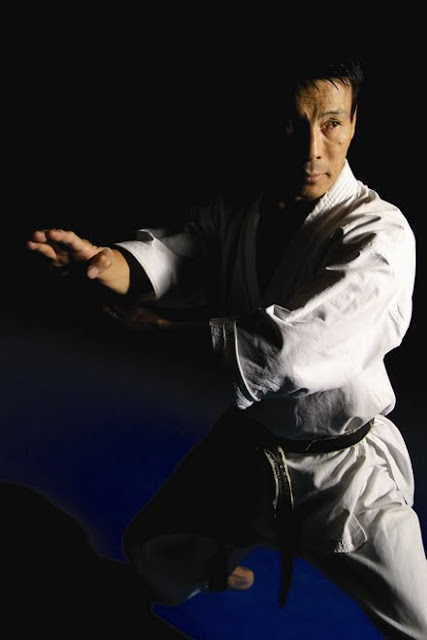 Mr. Yamamoto has practiced karate with me for about 10 years and he is very zealous while training. He came into shotokan due to our friendship and we have been friends more than 10 years. Both of the opponents would die and they would be absolutely tranquil, because there is no difference for each opponent. But there is a significant problem. Each adversary always keeps in his mind: what will occur in case of mistake? Maybe someone will be wounded. The body becomes enslaved and the mind just thinks about fear. This fear disturbs the use of your actual power. Kumite teaches us to stay tranquil. If you follow the Zen way you will have the emptiness in your mind while doing kumite. Fear and thought disappear from your mind and you don’t feel the fear. In this moment you are able to demonstrate your true power; the power that is available only to you. No emotions, no thoughts about past and future. This is Zen. That is why people who haven’t the experience of serious fighting or mortal combat, who just write books about Zen Buddhism in the martial arts whilst sitting in their chair, are liars. — Yes, I like to read very much. Usually I read books about the samurai and how bravely they passed away as a result of hara-kiri, ritual suicide. It is very important for me and I will tell you about this without any embellishment. The matter is that already three of my friends have died in such a way, the last from them in December last year. The most courageous way of hara-kiri is crisscross: first from left to right, then from below to upwards to get hieroglyph “ju” that means “ten”. Maybe you know the famous Japanese writer, Yukio Mishima; perhaps you even read his books. He was my student. We trained together for one and half a years and he was much older than me: he was 45 and I was 24. 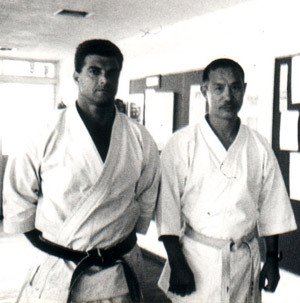 And one week before his passing away he came to the dojo and we were training together again. After training we were in the traditional Japanese bath “furo”; his behavior was normal, he laughed (in fact he was very cheerful person) and nobody — even I — couldn’t suspect that he was going to leave his life. But you see it was a very important decision and one week prior to his death he certainly knew that he would do it. I very much respect him for it and I believe that he is a really great person. There is even a history how Yukio Mishima has made this step. He came to the office of the commander of the military base of the Japan Defense Agency, came into the room and everyone — even those who has thought suddenly something was wrong — had no time or the possibility to stop him. He had locked the door of the room. He was accompanied by his friend Masakatsu Morita. The fact is that under the code of the samurai, after the worthy person will make a hara-kiri, his friend, collogue or student — someone whom he trusts and respects — must chop the head off. Having opened his stomach with his blade, he felt an inhuman pain and Morita in the meantime held a sword in his hands, and his hands shivered because of excitement or inexperience. Then Mishima became angry and started to shout at him: "Let’s do it — faster!" After that, he (Morita) struck, but he missed and has split a part of Mishima’s skull. Mishima then screamed even more loudly: "You are fool! What are you waiting for? Let's do it quickly!" Second impact of the sword of Morita only fell onto Mishima’s shoulder and only after the third attempt he completed the task, (beheaded him). Subsequently the police rushed into the office. Please trust me, these events are true and fixed in the police report. I do not want to scare you; I just want to say that this person I believe had a strong spirit. — I think that we (I and my Russian friends) practice karate with the same spirit, mood and ideas. Likely, people who practice karate with very similar ideas have identical inquiries, needs and purposes. The name of our organization — Karatenomichi — means, way of karate, way to karate, way due to karate. Perhaps this also is the way in which we walk the karate path together; and we should meet many people on this way. Somewhere this way could become wider and somewhere it could become narrower. The most important thing that I want to pass on to you all, is never forget about the source of karate, its basic functions and purposes. 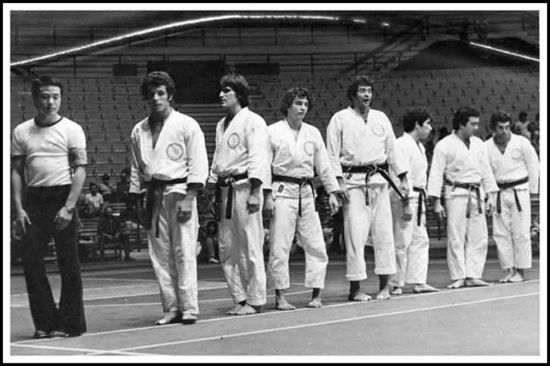 Because if you ignore this and do not execute diligently all techniques, you will absolutely walk other way, which is very far from the karate which I try to bring to your country and to your life. Hehehe e eu me lembro do Takeuchi falando sobre o Yahara: - Esse, biado!! !